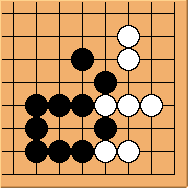 Zokusuji is a Japanese go term, referring to an unsophisticated move, which achieves some simple objective but gets less out of the position than a better move. 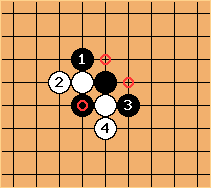 Typically it loses sente (example 2), erases good aji, strengthens the opponent (ex. 3) or leaves unnecessary ko-threats (ex. 1) or bad aji (ex. 3). It often also loses points (ex. 1). Zokusuji literally means "crude line of play" and is often translated as "vulgar move" (俗手 , zokushu, for which the Korean equivalent soksu appears more often in Korean baduk literature ). It may be considered the opposite of tesuji. In Sakata Eio's Tesuji and Anti-Suji of Go, Bob Terry has translated zokusuji as anti-suji, because that seems to be the way Sakata intended it. In his book Sakata says that zokusuji involves a loss. But people will sometimes say that a play is correct, even though it is zokusuji (zokusuji nagara?). 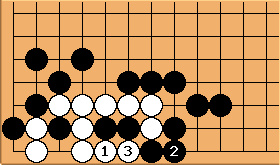 Sometimes the zokusuji (crude line of play) is the correct move. In that case we wouldn't call it a vulgar move. 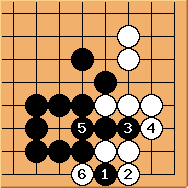 Most of the time, zokusuji is incorrect, and spoils the correct line of play. In that case, we could call it anti-suji. An example of zokusuji, taken from Gokyo Shumyo, Section 1, Problem 34 / Solution. Using the snapback suji , White lives. Later on he will be able to capture a stone at a, or Black will have to waste a move there. Capturing two stones gives him five points. This is tesuji. This is a crude move. Yes, it's atari, and Black cannot connect at a because he's in shortage of liberties: White will capture four stones at b. But it is still a vulgar play, and the next diagram shows why. forces White to capture two stones in order to live. White has only four points from the capture, and he has wasted the possibility of capturing an extra stone at , as in Diagram 1. 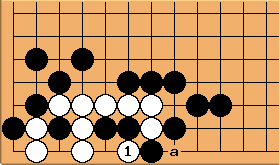 By playing in a vulgar way, rather than tesuji, White has lost points, although the objective of living has been achieved. It's not only a matter of losing points - in Diagram 2 Black has a large ko threat left at b, whereas in Diagram 1 there is no threat. is zokusuji. It takes gote. plays tenuki. Later - is Black's sente. is tesuji. Black sacrifices that stone for sente. Black can play kikashi with - , but he weakens and leaves cutting points behind (marked). Now he can protect the cuts, but White is greatly strengthened. Tesuji is to extend; atari atari is zokusuji. Comment: Sometimes atari-atari is correct, zokusuji nagara. In contemporary go terms, the author Nam Ch'i-hyeong states that soksu roughly equates to zokusuji. See guzumi. Cf. bad style. In English, vulgar is "common" not "crude." So, when I play, my good moves are vulgar, and the rest are blunders. It could easily be common, and correct -- in fact, if the problem is easy enough for ME to read, you expect the vulgar answer to be the correct one. xela: I don't agree. Vulgar means "common" used in a perjorative sense (as an insult), therefore something that's vulgar is also crude and/or in bad taste. Bill: We are far enough from Latin that crude is closer to the modern meaning of vulgar than is common. BobWhoosta: Those who insist on maintaining the ancient meanings of words are being nice. Bass: @Bill, that is only true for some meanings of common. Bob McGuigan: As used in zokusuji zoku has the meaning of common in the sense of the common people, as opposed to the elite. Think also of unsophisticated or unrefined. There is a term in everyday Japanese that is interesting in this respect, nagarazoku which refers to people (zoku) who do more than one thing at a time (nagara) such as listening to their ipod while having a conversation with friends. So zokusuji refers to moves of unsophisticated players.